I had never been to New Orleans before the flood. My deepest emotional connection to the city has always been Tom Waits’ brilliant ballad, I Wish I Was In New Orleans, which is the song used in the montage above. I had know particular opinion of the place, except that I wasn’t much interested in the notorious debauchery of Mardi Gras, and I suspect a lot of exaggeration in terms of the seedy, dark side of the city that so many writers have so enthusiastically given their verbiage to. My good friend Andy, who gave birth to the Do They All Die? series on here, has been living down there for the past year, aiding in the rebuilding project. It’s hard work, what he’s doing there. Work that burns out a lot of the people who try to do it. Andy has signed on for a second year of rebuilding. We’re proud of him up here in the northeast corridor. He’s been encouraging me to come and visit him in New Orleans all year. Before that, he spent four years trying to get me visit him in Toronto. Which I never did. He called a few weeks ago and explained that he was coming to Philly, and I could hitch a ride down with him, splitting the cost of gas, and then I only needed to pay for a plane ticket back. I agreed. We left two Sundays ago, on August 10th. The plan was to drive to Pittsburgh, spending the night at our friend Jess’ place. On Monday, we’d drive to Tennessee, having dinner with an acquaintance of Andy’s, and spending the night. On Tuesday, we’d get into New Orleans. I’d fly back to Philadelphia at dawn the following Sunday, giving me roughly four and one-half days in the Crescent City. The plan went off pretty smoothly on Day 1. I met up with Andy a bit later than hoped, but we made good time to the ‘Burgh. Jess took the two of to a friend’s birthday party, for free food and drinks. Andy and I are dazzlingly charming fellows, and somehow, both Jess and the birthday girl, Sarah, were talked into joining us on the trip. We thought as late as Monday morning that they weren’t coming, and, then, they bought plane tickets. We decided we were now running late and twice as populated, and thus too much of a burden on some stranger in Tennessee who I can only imagine as being achingly beautiful. We elected to drive straight from Pittsburgh to New Orleans, a 1200 or so mile drive, getting into town around dawn. TC, Sarah, Andy, and Jess. That’s us there, sometime early on Tuesday, probably somewhere in Tennessee or Alabama, two states in which we spent a lot of time. Upon arriving, we met up with Maura, Andy’s better half, who made us pancakes as she and her roommate Caitlin prepared to eat their weight in ice cream, later that day. Maura on the left, Caitlin on the right. There were no survivors. During the day we slept and took it easy. That night, however, we went to the Maple Leaf, for Rebirth. Andy had been talking about the Rebirth Brass Band for a while to me, and I was excited. But to talk about Rebirth to people who haven’t seen it is like trying to explain the Sun to owls. Rebirth Brass Band are eight or so black men. They’re dressed like they belong in amateur rap videos. Flatbilled, crooked hats, wifebeaters, jeans. The Maple Leaf is dark, but they’re younger than you’d expect a 25 year old band to be. The youngest members are probably in their 20s, and the oldest are, perhaps, in their 50s. In the back of the stage stand the drummers, two of them, I believe, and the sousaphoner (sousaphonist? sousaphone player?). The front of the stage is all brass. A couple of trombones, a sax, and a lot of trumpets. Anyone in the front row may sing, apparently, but singing isn’t really the point of Rebirth. Rebirth is shockingly loud, for starters. Our ears rang all the next day. At times, if you stand close to the stage, the volume is so extraordinary my ears couldn’t handle it, I heard the horns like they were coming through blown speakers. They are, in fact, unignorable. They are demanding, as well. Tuesday nights at the Maple Leaf allow no room for dissenters, for the indifferent, for the analytical or critical. You go, you hear, you dance, and there is nothing else, anywhere. You are with us, or you are someplace else. They’re a tradition with all the passion and energy of a revolution. They’re beautiful like fire. The next day we awoke slowly. It was raining, and our plans involved a bit of a tour of the city, so we had nowhere we needed to be. The tour is a strange thing. Of course, New Orleans, as a city, post-Katrina, is a strange thing. New Orleans has a remarkable and distinct identity, geographically and architecturally. It gets hot, but, at least during the week I was there, the heat was bearable. As so many have said before, however, it’s not the heat, but the humidity that gets you. In and around the Bayou, the humidity is so fierce that every time I stepped from an air conditioned building or car, my glasses fogged. The humidity means it also rains, at least a little bit, just about every day. The drainage system in New Orleans is absurd. The rain water falls into a drain, from which is it pumped into the nearby Lake Ponchartrain. When Katrina hit, Ponchartrain flooded, and the water in New Orleans had nowhere to go. That, of course, was just one of the problems that others have thoroughly documented. Anytime a hard rain lasts longer than about 30 minutes in New Orleans, the roads start to flood. Of course the roads deserve a brief mention. New Orleans roads might as well be unpaved. They’re Third World rugged. They have cracks, bumps, potholes, sinkholes, the works. Near Andy’s house is a road where the pavement goes up. Like a reverse-pothole. You can’t avoid it. And it’s only about a foot or so tall. In some ways, New Orleans is like a European city. It’s not nearly as densely populated, of course. And not nearly as old as Amsterdam or Paris or London. But the buildings follow adhere to a style that you don’t really find anywhere else. And the city gives the impression that these buildings have always been here. There was never any wild swampland, any plains or forests. 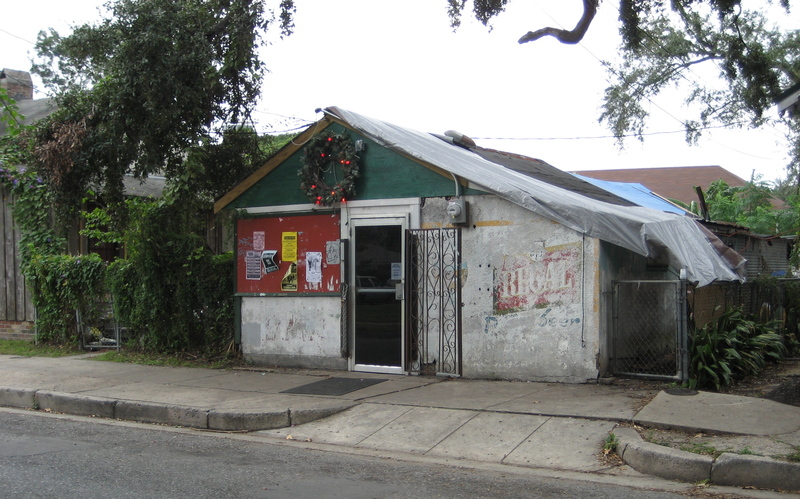 There have always been these brightly colored little shotgun houses, with their ornate column and draperies and shutters, live oaks sprawling above and beside them. Beyond that sense, the houses themselves are something to behold. They are, nearly every last one, ornate. 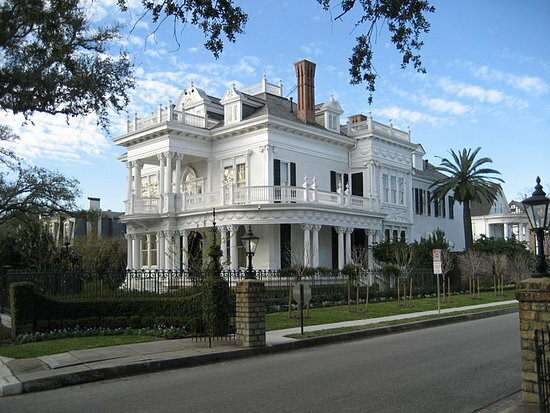 Pictured below here is the Wedding Cake House, as it’s known, on St Charles Street. The house is immaculate, and its perfect whiteness is, really, the most significant separating feature. The rest of the New Orleans architecture is similar, albeit, usually smaller, but still with the columns and rails and the rest. The difference is a certain amount of decay. Sometimes the paint is chipping. Sometimes a house almost appears to be leaning. Some houses are painted so garishly brightly, the owner must be some kind of clown, and yet, the house fits in perfectly. New Orleans buildings are drunks in tuxedos. A little bit of mud on the shoes, the tophat is the top punched through, a little stubble on the chin. Huge trees line every main street in the city, and hanging from some of them, still, are beaded necklaces from February’s Mardi Gras parades. The city satires respectability, that old-fashioned southern aristocracy is New Orleans favorite joke. The parody that is New Orleans architecture. We took the tour of the destroyed areas of town, which, of course, is what most people back home have been curious to hear about. So, how is New Orleans, after the storm? Odd. A lot of the buildings still have visible waterlines. In general, the visible waterline is somewhat lower than where the water peaked, as during the storm the water would reach its height, then sink, resting a few feet below the high watermark, and staying at this second line for days or weeks. So, if you see a watermark five feet high, the water probably reached seven or eight feet. Many houses still have the spraypainted messages from rescue workers, signaling that a house had been investigated, and what had been found there. Perhaps no message is more famous or haunting than this one, with 1 Dead in Attic spraypainted on the front of the house. The resident climbed into his attic to wait out the storm. When the water rose into it, he couldn’t get out, he drowned. There are a lot of houses with messages, though, all over the city, but especially in the 8th and 9th wards. Most are somewhat more abstruse than the bluntness that is 1 Dead in Attic, however. The Lower 9th Ward has gotten a lot of press, and justifiably. But it’s hard to explain what it’s like to be there. There is nothing. There’s not enough left to even get a good sense of what was destroyed. All that remains of the Lower 9th are the foundations. There are few battered houses, signs of rubble, all that. I remember being in New York after 9/11, and seeing the stunningly large pile of rubble, broken glass and steel and concrete, and being shocked. Seeing the Lower 9th isn’t like that. You could drive by it and not realize that there had once been hundreds, thousands of houses there. There was total destruction. Utter. All that remains is grass. There are a few rebuilt houses there. A few of them are even occupied now. And I can only imagine it’s bizarre and even terrifying at times to live within the city limits, with hardly another soul within a mile of you most nights. New Orleans is unique. It’s a stunningly poorly run city. Remarkably corrupt. Irrepressibly infuriating. It’s also beautiful. Dynamic. It’s alive in a way that few cities can be. Strangers on the street say hello. Your next door neighbor is probably dealing drugs, but he’s quiet and friendly as anyone you’ll meet. There are jazz bands everywhere–at the clubs, on the streets, at the midnight bowling alley. I could live there, I think. After all, I live in Philadelphia, so I already have an affinity for flawed, great, American cities. Post-script: On Wednesday night, Jess, Sarah, Andy and I were joined by our new friend David, where we went to a bar known as Snake and Jake’s Christmas Lounge. The place opens up around 9PM, and stays open till the bartenders feel like shutting down. This is the kind of place that can’t exist just anywhere. The picture below is what the place looks like during the day. At night, it’s almost entirely invisible, except that wreath is lit up. They’ve got Schlitz for $1.50 and the other beer is, I think, $2. The bathroom has no door. While I still feel a little dirty from the place, I’m glad such dark, joyful places exist in the world. Snake and Jakes Christmas Lounge: Dive Mecca.